I enjoy teaching martial arts. It is an incredible feeling of satisfaction to see the expressions on the faces of my students as they discover new techniques and how easily they can apply a technique in a self-defense situation. It is also an extraordinary feeling of discovery as I explore kata (forms) either through visualization or by watching my students perform an application and all of a sudden see another application. Learning martial arts is an endless endeavor and I thank God I was led to the martial arts as a young teen in 1964 and had so many fantastic opportunities to expand my martial arts experience particularly after I started teaching karate, kobudo, jujutsu, and self-defense and other arts at the University of Utah in 1970, the University of New Mexico in 1975, the University of Wyoming beginning in 1977. In 1992, I applied for membership to Juko Kai International. One of the best decisions of my life. JKI opened so many new martial arts to me - it was an incredible opportunity - I am so thankful that my membership application was accepted. After I became a JKI member, I attended as many national and regional clinics that I could. It was rare I ever missed a National Clinic. I also attended some regional clinics including those related to Combat Ki and others related to samurai arts, kobudo, and kata - particularly Okinawan kempo, naginatajutsu, sojutsu, iaido, hanbo, etc. In Juko Kai, I've had the opportunity to branch out and train in dozens of martial arts - it has been the best investment of my life! If there is another traditional martial arts organization in the world with so much expertise, so many great martial artists, with opportunities to learn an endless number of martial arts and techniques, I would be very, very surprised. Most organizations take your money, provide you with a certificate and member card, and you never see them again until they want their annual dues in the following year. At JKI, you can learn so many martial arts at dozens of clinics each year. But to join, you must have legitimate credentials, or a sponsoring sensei. Anyway, I love to teach, whether it is martial arts or geology. When I teach, I use to try to teach people to be tough and learn to take anything thrown at them. This is good for only a few, as most people give up long before earning a black belt. Over the years, I've mellowed and discovered an instructor must be entertaining - students want to be entertained, so I now try to make classes enjoyable for all of my adults. At the same time, I teach them many powerful techniques that I wish I could get them to used excellent focus and power, but not all of students what to put in the sweat and blood, so I work with each person's personality to make sure people are satisfied, but can also learn to defend. So, in my classes, a few students will work at an extreme level learning a self-defense technique while at the same time, learning to use the technique with great speed and applying body hardening (shitai kori) training such as punching and kicking each other with a fair amount of power - this is to help them learn to take a punch and how to deliver a punch - how most karate should be practiced. But most students don't want to learn to be killers, most want to learn the same technique without hurting someone or being hurt (actually, when one learns to use shitai kori, there is little to no pain, but it looks scary to most). I love it, but it is hard to convince others that they will live to see another day and will actually enjoy punching someone and getting hit. On Wednesdays at the Arizona Hombu dojo, we train mostly in karate bunkai. 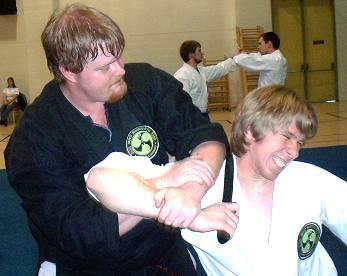 Bunkai is the Japanese word for practical application and basically means self-defense. So, it is bunkai we focus on Wednesday evenings at the Arizona Hombu Dojo. This is the smallest class during the week which really puzzles me. I would think everyone would be fascinated in learning how to defend themselves, but most people are satisfied with training in kata and kobudo. Wednesday self-defense nights, I often take one of our kata and take one or two parts out of the kata and apply them in a realistic self-defense situation - defending against an attack, a grab, a take down, choke, multiple attackers, an attacker armed with a gun, a rifle, a knife, a club, etc. As the students train with self-defense, they start out exploring modifications and slowly gain muscle memory until they can put things into overdrive after about 5 to 10 minutes. After they have learned a technique, I add a common weapon to the defense. The defender now arms themselves with a magazine, book, a kubotan (pencil like stick or key chain), handful of coins, a rock, lug nut, a knife (tanto), karambit, or some other handy weapon and try the same self-defense technique with a weapon. How do you defend against a rifle? At the halfway point of the class, we move to hanbojutsu and then to another samurai art. Our students include many highly educated professionals, retirees, military, some young adults and many women. The nice thing about this training is the students, no matter what age, learn about martial arts, self-confidence and gain considerable physical exercise, flexibility and balance. It is much better than attending any gym.